The mosquitoes here are the most enormous and plentiful I've ever seen or dreamt possible. (Just got one in a clap that fell onto my keyboard.) And they have gotten progressively worse each day. I've been heartened to hear from researchers that this is one of the worst years they've seen, and even the tough grizzled ones who refuse to wear head nets have started donning the black veils. Look at the sky. Those are all bugs. Mosquitoes don't need blood for food; they use it to nourish their eggs. 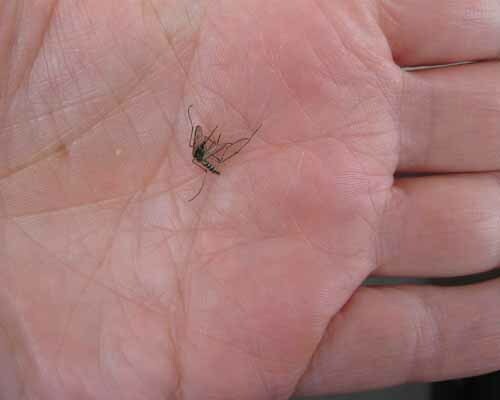 There are 3,450 species of mosquitoes, which contribute to the roughly 100 trillion alive at any moment. Canadian researchers in the arctic stood still outside for a minute and counted 9,000 bites. At that rate, a person would lose half their blood – enough to kill them – in about an hour. DEET is the only thing that seems reasonably effective against the bugs, though even that doesn't keep them totally at bay. And since the chemical is known to melt through nylon and plastic, most of us don't like to put too much of it on our skin. I thought the three layers of shirts I had on yesterday would protect me from the pack that took up residence on my shoulder, but they managed to get their stingers through to my shoulder. The photo below is of my arm about 10 seconds AFTER it had been wiped clean of bugs. There were probably five times as many before I brushed them off. The windows and ceiling of our van are covered with carcasses, as are the tables and floors in our work tent. One of the journalists posted this video of a slaughter in the van. No one seems much phased by bugs banging into their face mid-conversation, though the ones that go directly into your mouth and up your nose are still disconcerting. Mostly, it's the constant buzzing and swarming that drives me slowly mad. I keep thinking I'm going to reach a point of Zen when I find myself peacefully accepting the omnipresent bugs. It hasn't happened.